East: Systemic approach – all events in the universe are interconnected; searching inside yourself – by becoming a part of the universe through meditation and right living. West: More focused on individual events and the role of the person; searching outside yourself – through research and analysis. East: The true key is inside. The inner world of a human being and his or her ability to control and develop it is of the highest value. The way to the top is inside yourself, through self-development. West: The main values are success and achievement. The majority of success and achievement criteria have an external nature (money, faith, popularity, etc.). The way to the top is through active outside intervention. East: A human being is an integral part of the universe and the society. People are fundamentally connected. Duty towards all others is a very important matter. Collectivism is stronger. 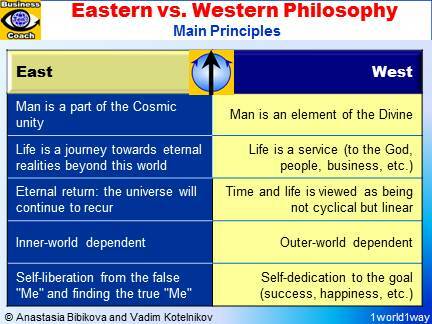 West: A human being has an individualistic nature and is an independent part of the universe and the society. Individualism is stronger. East: Cyclic development, hence improvement is a never ending journey that has no limits. West: Linear development, hence improvement has a goal. Development stops when the goal is reached. East: The fundamentals of the status quo should not be questioned. The culture for radical innovation is weaker. West: The fundamentals of the status quo can – and often should – be questioned. The culture for radical innovation is stronger. East: Entrepreneurial creativity and venturing is contained by the habit to control one's passions.